Impossible to dismiss, retard or otherwise protect oneself from yellow hover pop-ups. Always in the way of seeing or modifying code. You want what these are doing, but you don't want them making what you're doing impossible. PyDev comes close to that. Eclipse's Run and Debug buttons are never wired up to quickly fire off the last thing you did—you always have to dig through them or right-click on the file or test case to ensure you're back running where you need to be. This is also a greater problem with the Eclipse debugger itself: IntelliJ's debugger controls for starting, restarting, etc. just get you right back to where you are working much quicker and more cleanly. Hinkier project structure requirements, less stable, etc. IntelliJ is is just "eager" to make a project out of any pile of directories and files you happen to have. ...I went for PyCharm at the suggestion of a stackoverflow.com respondant. Mind you, it was painful because I'm strictly religious when it comes to Eclipse. However, I have to get work done and I'm betting that PyCharm saves me literally an hour or more during a day of intensive coding and that's not even talking about the sheer frustration of using PyDev. Words cannot express how embarrassed and heart-broken I am at this. At this point, I would probably not use IntelliJ for Java development, though it does do some things much better (debugger as noted above and also Maven integration), I am religiously devoted. However, for Python development, I'm afraid the goose is cooked. I'm resisting the call of the purchased package which gives more capabilities that I might need as things go forward. It would be a financial burden to me and the cost if my company were to pay is even higher. Let's just say that after a bit more than a week of intensive PyCharm use, I'm happy with the community "free" edition and wondering where this will ultimately lead me. Download tarball from PyCharm website. Create appropriate launcher for your platform. 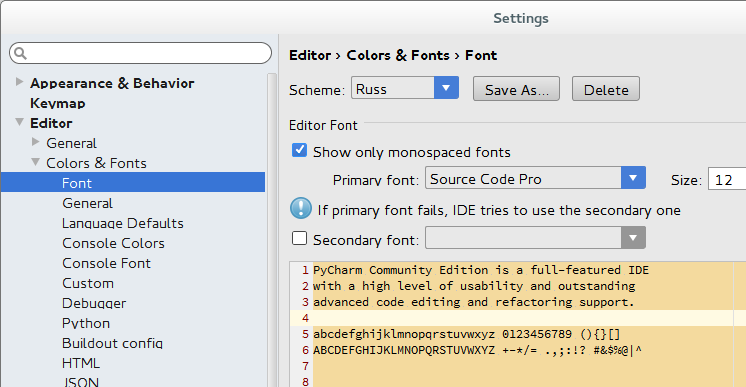 Unlike Eclipse and PyDev, PyCharm will make a project immediately out of any subdirectory, no need to fret over set-up. It will, however, create a subdirectory of its own, .idea, in whatever parent you choose. You can simply discard it once you've finished. Navigate to and select the parent subdirectory of the script(s) you want to include in your project. Click OK, the project is created and you should see whatever happens to be inside already, including your script, fun.py, if you've already created it. If you haven't created it, just right-click on the subdirectory/project name at the top of the leftmost pane and choose New → Python file, it asks for a name, you type it in, then click OK, a new window will open and you can type it in. To endow your script with command-line arguments, click in the top menu bar, Run → Edit Configurations.... You'll notice that, under Python, it's created an entry, fun. Click on that and then, to the right, type some arguments into Script parameters:. Click OK.
Run it again just as above to see the difference in output. To debug your script, you need merely set a breakpoint on an executable line in it by clicking in the space between the displayed line numbers and the code area. A red dot will appear. Instead of choosing Run 'filename' as above, choose Debug 'filename'. This topic is identical to last year's tackling of IntelliJ vs. Eclipse habits I was forced to endure because I worked in Java somewhere that required me to use IntelliJ. Therefore, you'll find my comments of that nature at IntelliJ: Configuring keyboard shortcuts. In particular, I like Eclipse's Ctrl+D and Alt+Left/Right mappings and have changed IntelliJ's accordingly. There's a lot of power in these for IntelliJ (and probably more in Eclipse I don't know about), but those three are the most frequently used. Also, I'd like to map IntelliJ's Find usages to Eclipse's Shift+Ctrl+G and a couple of others when I get around to them. Source Code Pro seems nice. See here. Click Settings icon in toolbar (or File → Settings...). Go to Project: project-name.py → Project Interpreter. Click the Project Interpreter: list and choose Show All if Python 2.7 (for example) is not shown. Click the &plus; sign to add. Navigate to the Python binary and select it,*, probably python2.7. Wait a moment for the red underlining to begin to disappear.